Santa Claus is bringing his sled and reindeer to Atlanta, making appearances around the city this holiday season. Take the kids to visit Kris Kringle at his cottage in Atlantic Station, or at the top of one of the tallest skyscrapers in Atlanta. 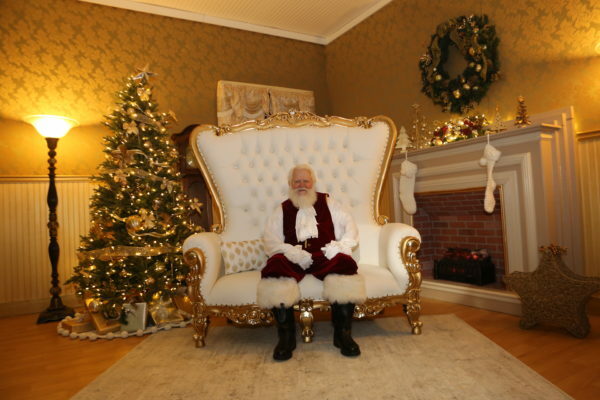 Peruse our list know where to take the family to hang out with Saint Nick. Enjoy a breakfast with Santa inside of Atlanta’s most iconic skyscraper restaurants located in The Westin Peachtree Plaza. At the Sun Dial, there will be a breakfast buffet for attendees, complete with a “build-your-own” Bloody Mary bar and hot chocolate station for kids. There will also be activities geared to the whole family, such as ornament making. Admission includes a photo with Santa. Game out in this interactive Downtown hangout spot and have the family play Pin the Nose on Rudolph and write letters to Santa. Santa will be available for pictures from 1:30 to 2:30 p.m.
Santa will be among the procession that will course down Buford Highway. Live entertainment and marching bands will be a part of the International Christmas Parade. Get the pets out the house to meet Santa at this photo opportunity happening at the SunTrust onUp experience inside of The Battery Atlanta. Embark on a journey into 12 whimsical realms by going to the Santa’s Fantastical Immersive Worlds experience in Sandy Springs. Some of the interactive pop-up places include Peppermint Palace, Unicorn Dreams and Future Christmas. Pictures with Santa are included in the admission price. Choose to see The Grinch until Dec. 16. or Santa until Dec. 24 at Ponce City Market this December. Both of the iconic holiday characters will be taking residence within the shopping area for the holiday season. In The Grinch’s lair, he will be “grinching” away, and tree elves will be busy at work in Santa’s yard. Santa is opening up his cottage to guests in Atlantic Station throughout December. Walk-ups and reservations are welcome, and five photo packages will are available for purchase ranging from $24.99 to $49.99. Editor’s Note: The Grinch will be in residence at Ponce City Market until Dec. 16. See Santa until Dec. 24.